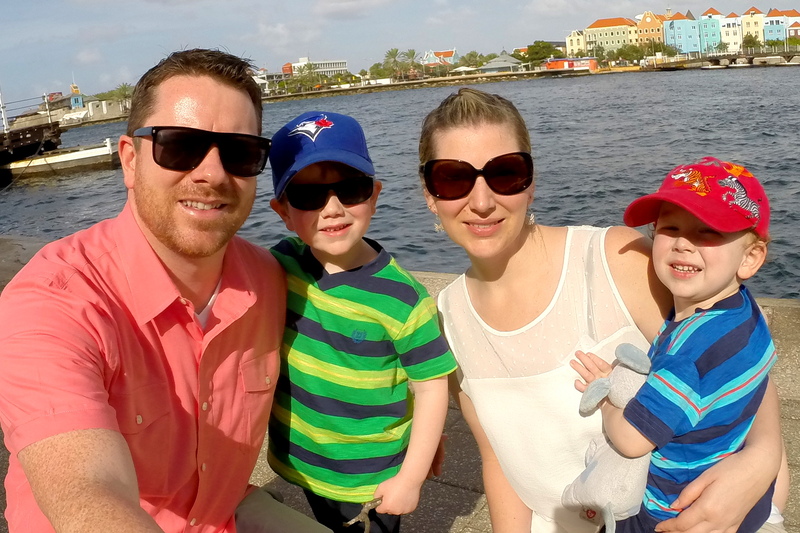 Today’s guest post was written by Roxanne Smith, an adventurous travel writer who loves to explore Europe by taking road trips. We have not yet taken a road trip in Italy (but it’s high on the list), so we’re happy to share this itinerary for an 11-day road trip around North Italy and Tuscany. If you’re looking for more road trip inspiration, read our perfect Ireland road trip itinerary for families or get inspired by these stunning landscapes from our Canadian Rockies road trip. Have you taken a road trip in Northern Italy? Are you thinking about travelling to Italy this summer? Do you want to see as much as you can? Discover ‘La Bella Italia’ on this amazing 11-day road trip that will take you to Italy’s most famous, beautiful and romantic spots. 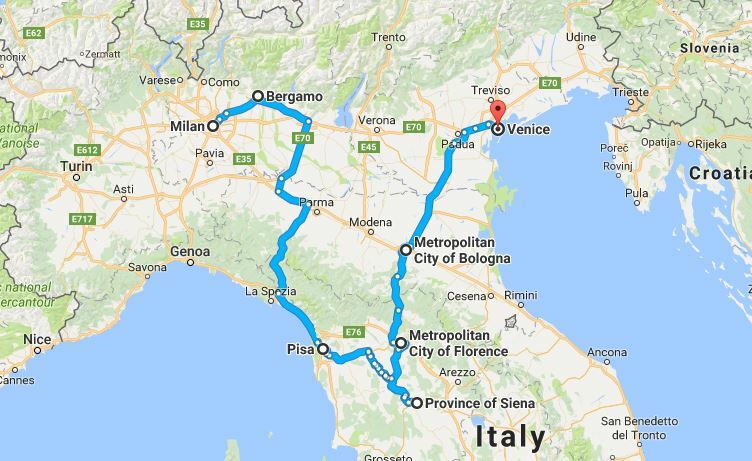 This road trip starts in Milan and ends in Venice, visiting Bergamo, Parma, Pisa, Siena, Florence and Bologna. Before you take this Italian road trip, it’s wise to book your rental car in advance to make sure you get the car you want. Don’t skip the car rental insurance. It’s wise to get additional protection, beyond what the car rental companies offer, so you avoid the unexpected hidden costs that may occur in the event of a claim. Hotels also book up fast in the summer so you should consider making reservations in advance to be safe. Agriturismo is another fun and unique way to experience the Italian way of life. Check the highlights of this tour and make online reservations to avoid waiting in long lines. Start your road trip in Milan, Europe’s Fashion Capital. This iconic city has a broad collection of fashion shops filled with designer brands, such as Prada, Louis Vuitton, Burberry, Gucci and Armani. Discover this true (window) shopping paradise in the Quadrilatero d’Oro (the Golden Square) and the famous shopping streets like Via Montenapoleone, Via della Spiga, Via Manzoni and Corso Venzia. 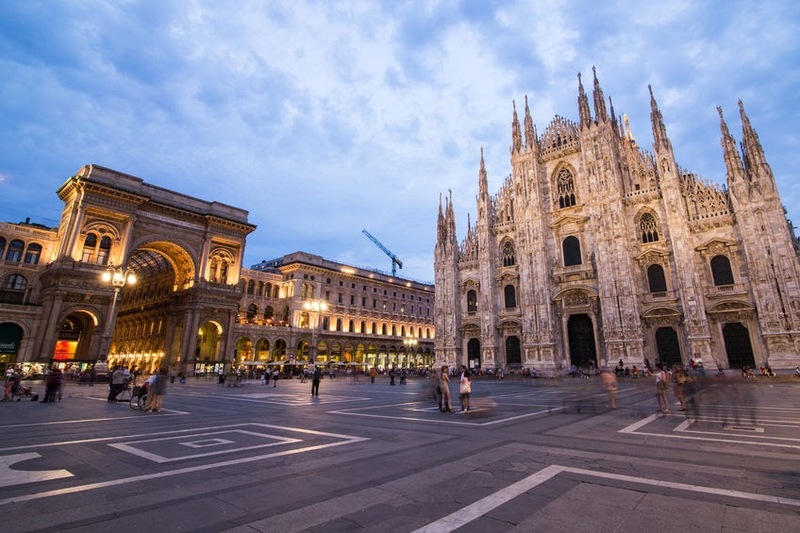 Once you’re finished shopping, enjoy the rich culture Milan has to offer. The Duomo (Santa Maria Nascente) is located in the heart of downtown Milan. With your ticket you can go up to the roof of the Cathedral. In front of the Cathedral is a gigantic square, Piazza del Duomo, where you will find some great photography spots. Just outside the city center is the monument Arco della Pace, which forms the gateway to Parco Sempione. In this park you’ll find Castello Sforzesco, a medieval castle with artwork by Da Vinci and Michelangelo (free entrance). Afterwards, take a rest in the beautiful Botanical Garden. If you’re a football fan don’t forget to pay a visit to the San Siro Stadion. If you have time, and want to go for a swim and enjoy an idyllic scene, make a day trip to the second largest lake of Italy: Lake Como. It’s about a one hour drive from Milan. 50 km, 45 minute drive time. Pick up your rental car and hit the road to Bergamo. It’s about 50 km east of Milan and has a beautiful, elevated old city that invites you for a stroll. 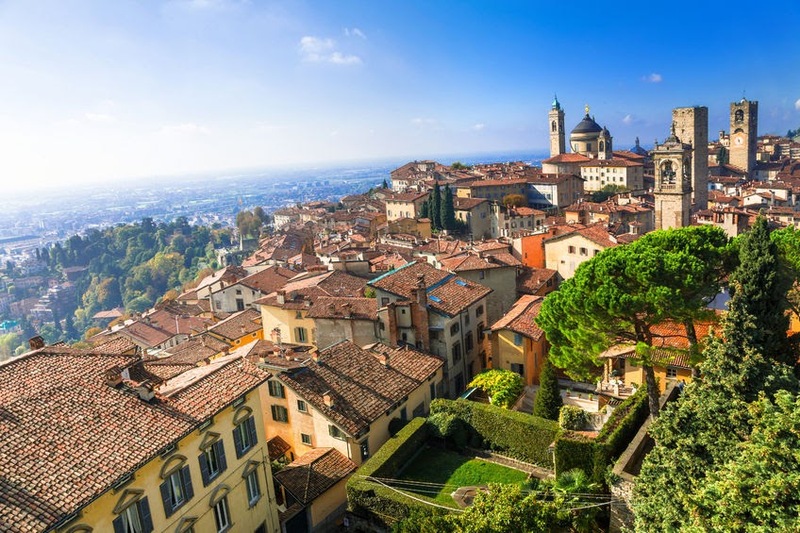 Bergamo is on the top of a hill and surrounded by thick Venetian city walls. The old town is car-free, so when you arrive, you will need to take a bus or a cable car to go further uphill. All the highlights of Bergamo are basically found in Città Alta, the high city. The old city center has many charming small restaurants, bars, craft and pastry shops. Once there you must try the ‘polenta e osei’. This sweet specialty is only found in Bergamo. It’s a cake covered with yellow marzipan, filled with chocolate, hazelnut cream and rum. On top there’s a little marzipan bird dipped in chocolate. Right in the middle of Città Alta is the beautiful Piazza Vecchia. Surrounded by medieval houses, narrow alleys and ancient towers. Palazzo della Ragione is the oldest still existing city hall of northern Italy. Next to it is the Gothic Basilica of Santa Maria Maggiore. Walk up to Palazzo Terzi for an amazing view of the city and it’s surroundings. 320 km, 3.5 hours drive time. Take the southern highway through the city of Parma. You can stop here to indulge yourself with the famous Parma cuisine: Parmigiano-reggiano (Parmesan cheese), Prosciutto di Parma (raw ham) and the more expensive Culatello di Zibello (salami) and Lambrusco (sparkling wine). Continue your trip to Pisa. 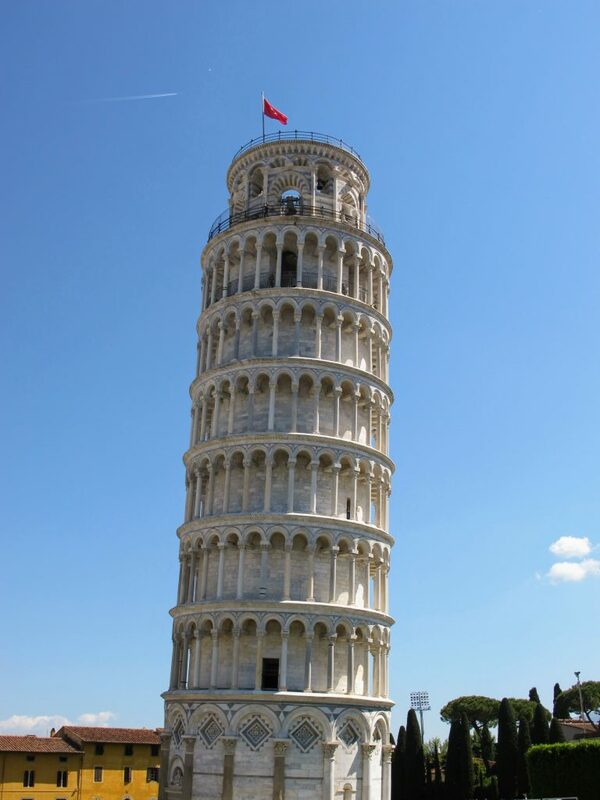 When you think of Pisa the Leaning Tower comes to mind. To climb the 800 year old marble bell tower, you’ll need to get a ticket in a reserved time slot. Each day a limited number of tickets are available. To avoid standing in line (especially in the summer) you can purchase your tickets online. 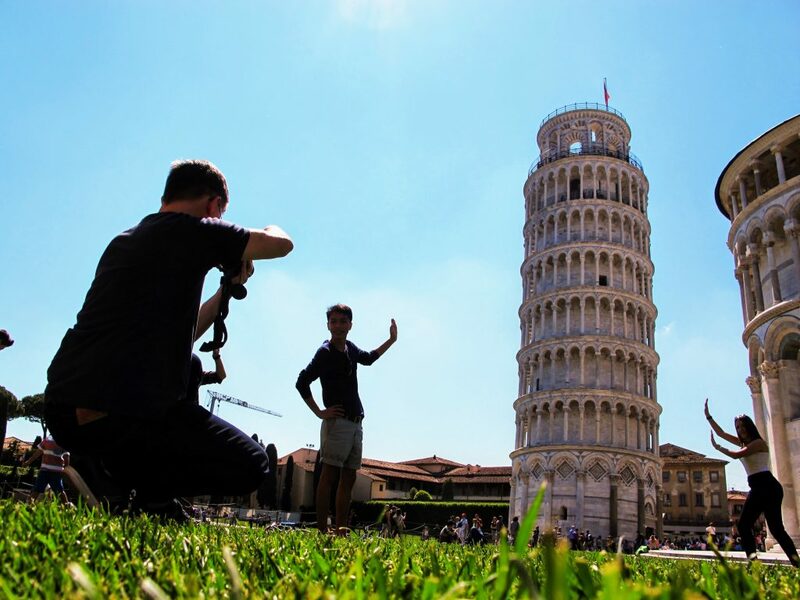 While you wait for your turn to climb up the 300 steps of the tower, join the other tourists and capture some creative photos of you trying to push back the leaning tower. 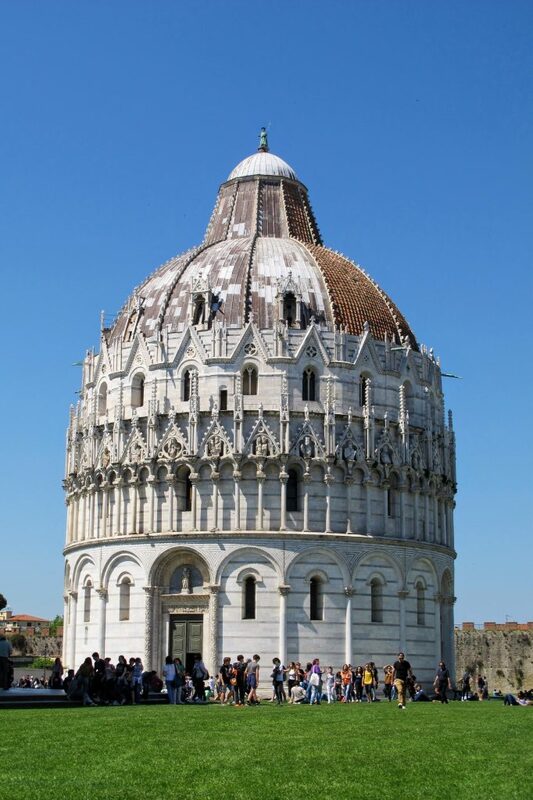 You can also visit the other monuments nearby: The Cathedral, The Baptistery & Camposanto and The Sinopie Museum. 126 km, 2 hours drive time. To get to Siena you must drive the beautiful Tuscany landscape, passing rolling Tuscan hills filled with tall cypress trees and vineyards. Along the way you’ll pass Volterra, a small medieval village that’s worth stopping for. It has tall city walls and a breathtaking view over the area and nearby San Gimignano. After this short break, get back in the car and continue your drive to Siena. 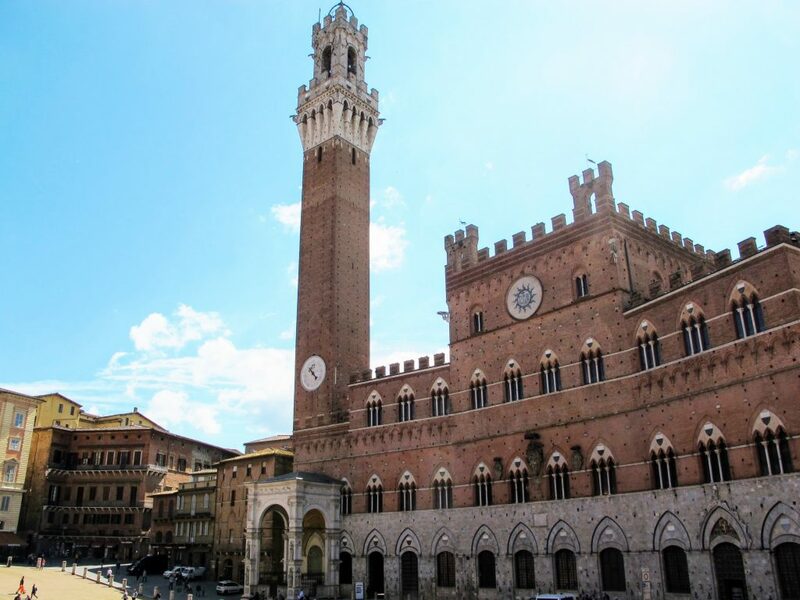 Siena is ‘the most beautiful city in Tuscany’ according to many Italians. There’s so much to see and do in this lively city. 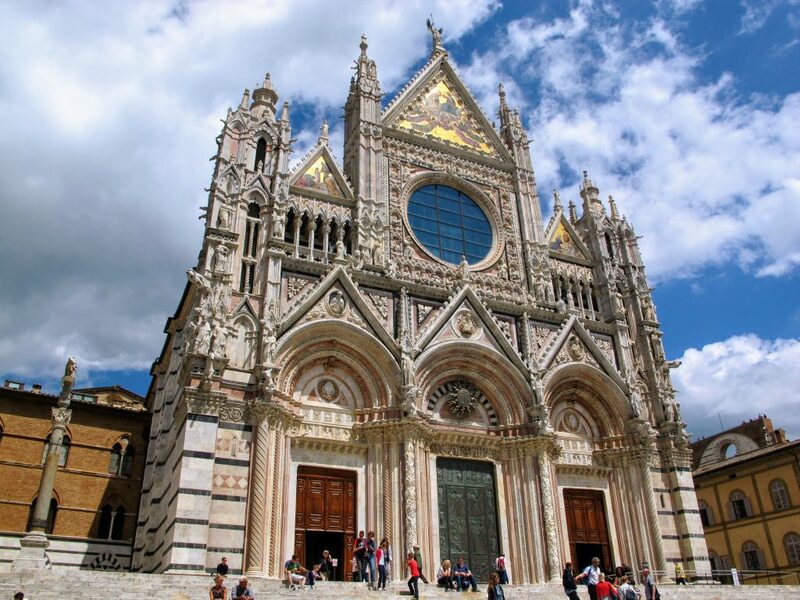 Let’s start with the impressive 12th century old Duomo di Siena (Cattedrale di Santa Maria Assunta). It mirrors the prosperity of the city. It has a well decorated facade, a beautiful inlaid floor and sculptures by Michelangelo and Nicola Pisano. The shell-shaped square, the Piazza del Campo, is an excellent place to take a break. Make sure you try a panforte, ‘heavy bread’ filled with fruit and nuts. Or try these other Siena specialties: pici (pasta), ribollita (bean soup) and cantuccini (sweet pastries). After these treats you can visit the Palazzo Pubblico and it’s Torre del Mangia. The tower got its nickname from one of the whistleblowers, Giovanni di Balduccio, who was called ‘Mangiaguadagni’ (eats his merits) because he would spend his entire salary on food. 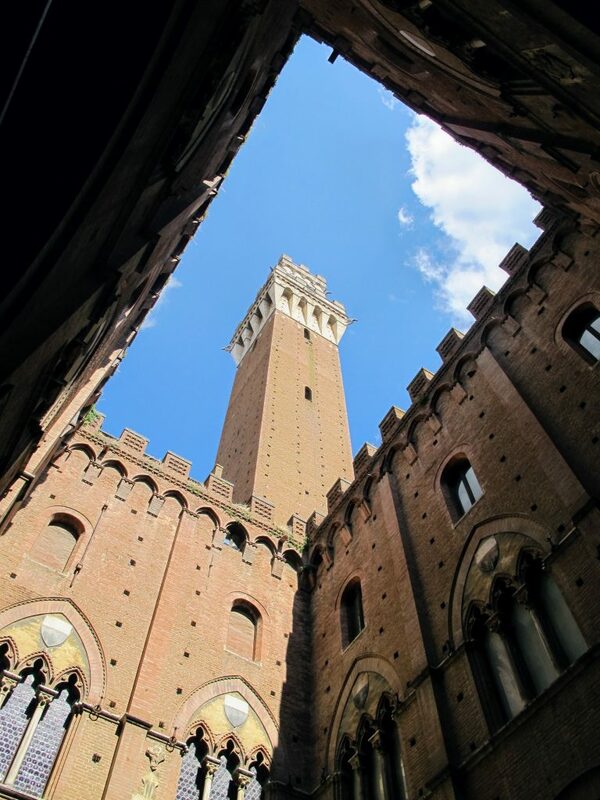 If you want to visit multiple monuments, purchase the Siena City Pass to save time and money. 80 km, 1.5 hours drive time. 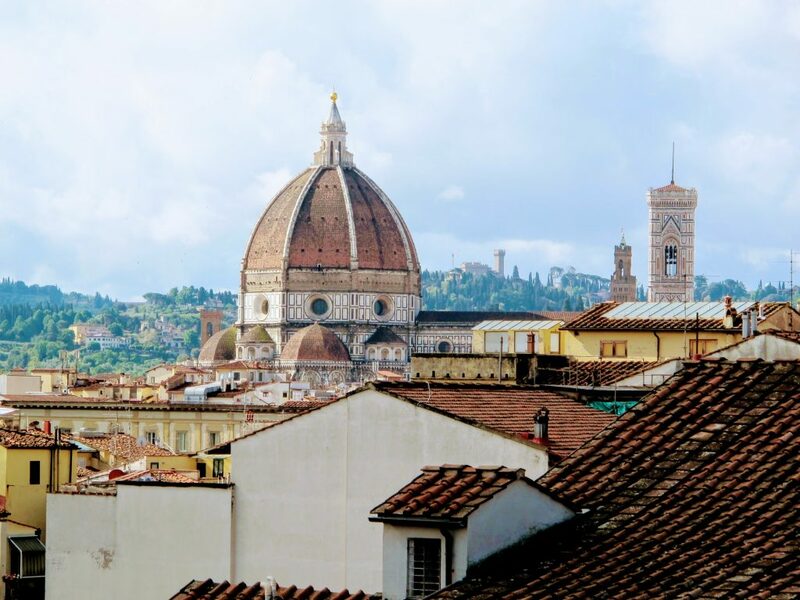 Florence, or Firenze, is Tuscany’s capital and the birthplace of the Renaissance. With millions of tourists each year, it’s one of the most popular cities in Italy. 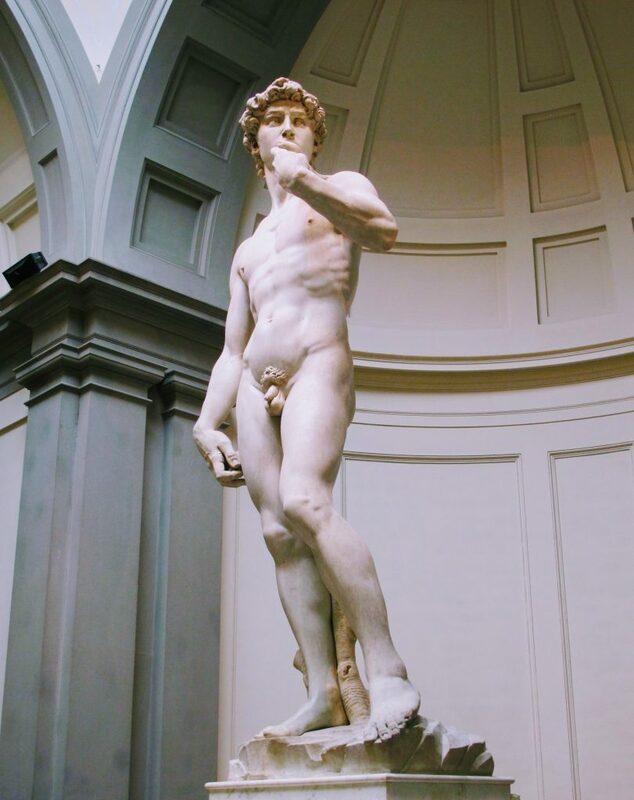 Florence is a perfect mix of history, art and culture. Due to the large number things to see and do it’s wise to dedicate a couple days here. Florence also has a city pass, the Firenze Card. It’s expensive (€72), so check the highlights you want to visit and see if it makes sense to get the card. A fun way to explore Florence is by bike. You can book a guided tour which will show you all the highlights Florence has to offer. 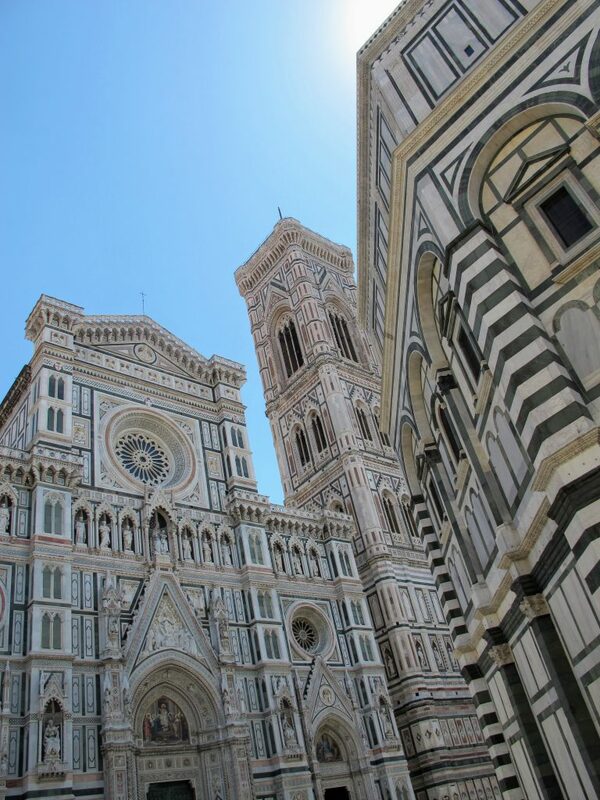 The Basilica di Santa Maria del Fiore is definitely a must see for every first time visitor to Florence. The white, green and red/pink marble is truly magnificent. The Cupola or dome by Brunelleschi is climbable with a pre-booked ticket. Next to the Duomo stands the Baptistery with the bronze Gates of Paradise and the 85 meter tall Campanile (Giotto’s Bell Tower). After climbing 414 steps you can enjoy a panoramic view over the city. Don’t miss Michelangelo’s famous David in the Galleria dell’Accademia and the art treasures of the Uffizi Gallery, where you can find the Birth of Venus by Sandro Botticelli. Of course, you can’t miss the impressive main square Piazza della Signoria and the Ponte Vecchio, with the jewelers shops on the bridge itself. Conclude your visit with the and Palazzo Pitti with the Boboli Gardens. 105 km, 1 hour and 40 minute drive time. After Florence your trip continues to Bologna. Bologna actually has three nicknames. The first is ‘La Grasse’, the thick, because of the rich cuisine. The second is ‘La Rossa’, the red, because of the many red roof tiles on top of the buildings and houses in the city. 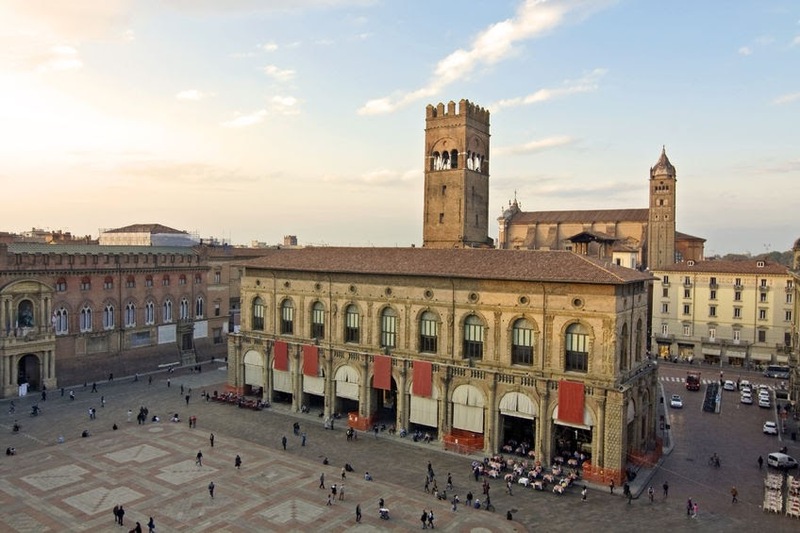 The third is ‘La Dotta’, the scholar, because Bologna has a University and is filled with students. The skyline of Bologna is formed by two skewed towers, the Asinelli Tower and Garisenda Tower. Both are remains from the middle ages. The higher tower, Asinelli, can be climbed, so you can admire the red rooftops from above. Piazza Maggiore forms the center of the city. The square is a bit similar to the St. Mark’s square in Venice. A great place to have some lunch or dinner. Bologna is world famous because of one pasta dish: Spaghetti Bolognese. Although it’s originally prepared with tagliatelle. 155 km, 2 hours drive time. End your Italian road trip in one of the most romantic cities in Europe. Venice is formed by a number of island connected by bridges and a maze of small streets. The most well-known neighborhoods are San Marco and San Polo. 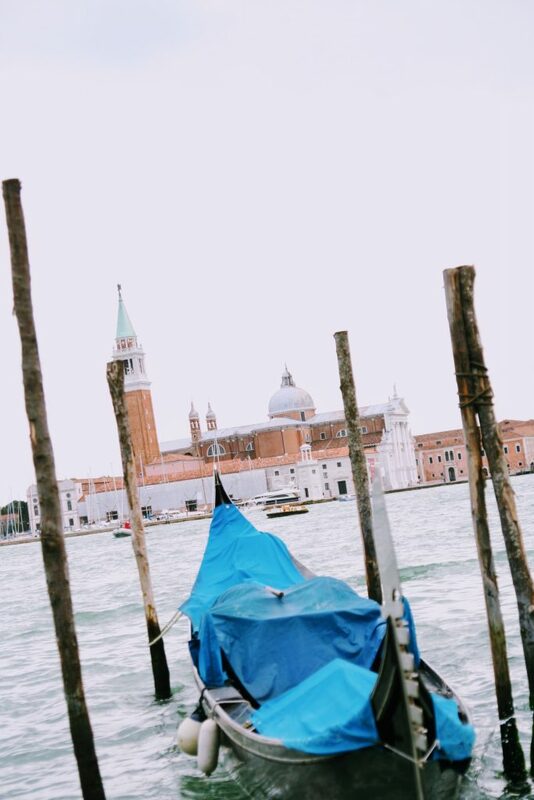 San Marco has all the famous sights: St. Mark’s square (with all the pigeons), the Campanile, the Basilica di San Marco and the Palazzo Ducale. In San Polo you’ll find the Rialto Bridge. On and around the bridge it’s always crowded. If you want something more quiet, just get lost in one of the many streets and discover the shops and wine bars. Or relax and take a seat on a bench at one of the many squares. 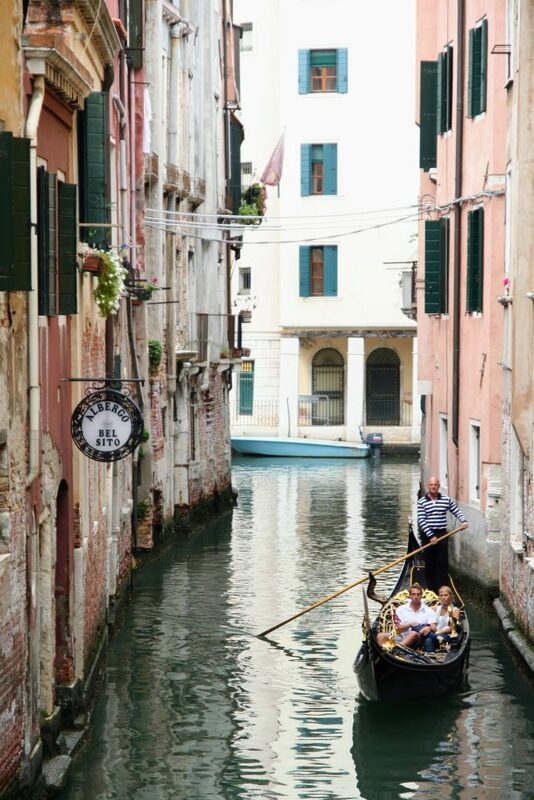 For the ultimate romantic Venice experience, take a famous gondola tour. It costs around €80 for half an hour (in the evening ± €100). Not a romantic type? You can take the Vaporetto (the water bus) line no. 1. Along the way, you’ll zig-zag across the Canal Grande and pass under the Rialto Bridge and Accademia Bridge. If you have a few more days to spend in Italy then I’d recommend adding a visit to Cinque Terre, a UNESCO World Heritage made up of centuries-old seaside villages on the rugged Italian Riviera coastline. You’ll want to spend at least 3 days in this region, so if you have 14 days for your road trip around North Italy then I would highly recommend adding Cinque Terre to the itinerary. So many amazing things to see on such a short trip … Italy never fails to amaze me! These pics are just stunning.. Very helpful and beautiful article!!! So much love for Italy, its people, architecture, art, and FOOD! I’ve never heard of Bergamo but it looks beautiful! Nice article, Thank You. You talk about hotel reservations in SUMMERr — how about early June, before summer? We prefer to wander about as whim takes us — stay longer or shorter, even return to a spot. Can we get away with this a have a decent possibility of finding rooms on a catch and catch can basis before the beginning of Summer? We won’t hold you responsible!